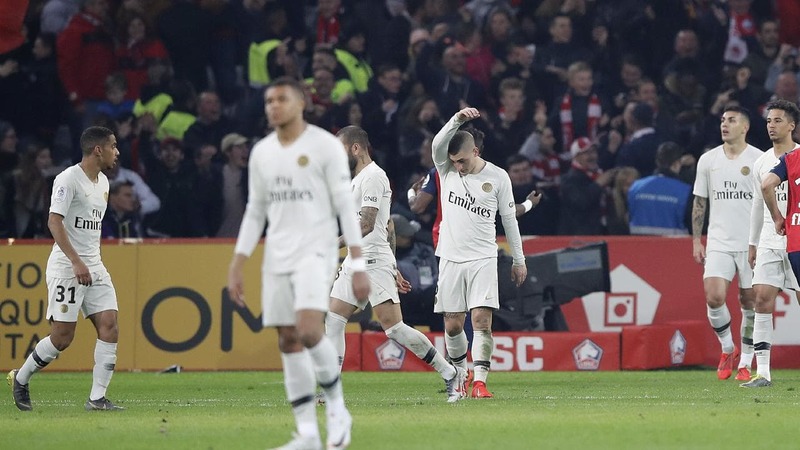 Despite cruising to another French Ligue One title, PSG suffered their heaviest loss in a while at they were beaten 5-1 away to Lille on Sunday. The defending champions who are still 17 points ahead of Lille, trailed as the 7th minute to a Thomas Meunier own goal but were soon level four minutes later thanks to left-back Juan Bernat. Bernat was then sent off 9 minutes to the break, setting the tone four Lille’s massacre as Christophe Galtier’s side scored four more goals in the second half to win it 5-1. Nicholas Pepe, Jonathan Bamba, Gabriel and Jose Fonte scored the four goals in the second half. The win means Lille remain second but move onto 64 points, 17 behind leaders PSG. In the battle for the other remaining Champions League spot, Lyon once again lost while Marseille and Saint Etienne registered victories. Lyon lost 2-1 away to Nantes, Marseille were 2-1 winners at home to Nimes while Saint Etienne defeated Bordeaux 3-0. Elsewhere, it was only Montpellier and Angers who registered the other Ligue One victories this past weekend. Montpellier defeated Toulouse 2-1 while Angers scrapped to a 1-0 victory away to Caen. In the Spanish La Liga, Barcelona’s lead at the top of the standings was reduced to 9 points as they were held to a 0-0 draw away to Huesca. Ernesto Valverde’s side who rested a host of key players could not find the back of the net in a game that they could even afford to lose as games are running out on the chasing pack. 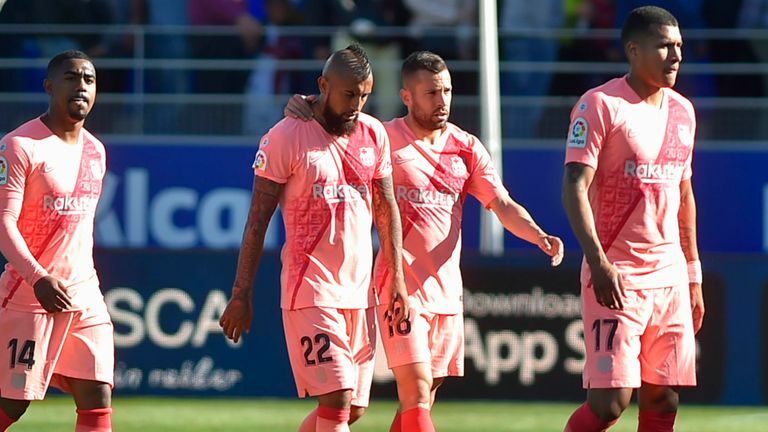 Barca rested several key players in the draw at Huesca. Barcelona are now 9 points ahead of second placed Atletico and 14 ahead of Real Madrid. Speaking of the chasing pack, Atletico Madrid were victorious in weekend’s fixture while Real are away to Leganes on Monday. Atletico defeated Celta Vigo 2-0 thanks to goals from Antoine Griezmann and ALvaro Morata. In the battle for the one remaining champions League position, Sevilla (4th) defeated Real Betis 3-2 on Saturday, Getafe (5th) drew 2-2 away to Valladolid and Valencia (6th) defeated Levante 3-1 on Sunday. Elsewhere, Bilbao, Espanyol and Villarreal also registered victories this past weekend. Bilbao defeated Vallecano 3-2, Espanyol were 2-1 winners at home to Deportivo Alaves while Villarreal scrapped past Girona 1-0. In the Italian Serie A, Juventus suffered their second loss of the season, going down 2-1 away to SPAL on Saturday. The loss to SPAL was Juve’s second this season. Juve took the lead on 30 minutes through Moise Kean but conceded twice in the second half to lose the game. However, they remain top of the standings with 84 points, 17 ahead of Napoli who cruised to a comfortable 3-1 victory over Chievo on Sunday, with Khalid Koulibaly scoring a brace and Arkadiusz Milik scoring the other. In the battle for third and fourth, Inter Milan, AC Milan and Roma all won while Torino drew and Lazio lost. Inter defeated Frosinone 3-1, AC Milan beat Lazio 1-0, Roma were 1-0 winners at home to Udinese while Torino drew 1-1 with Cagliari. Elsewhere, only Sampdoria who defeated Genoa 2-0 on Sunday were the other victors in the Serie A this past weekend. 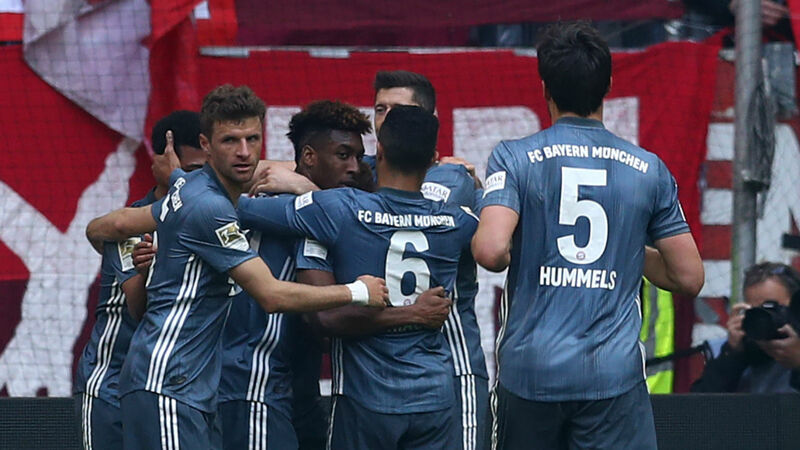 In the German Bundesliga, Bayern Munich maintained their one point lead at the top of the standings thanks to a 4-1 win away to Fortuna Dusseldorf on Sunday. Bayern still top the Bundesliga standings by a point. Kingsley Coman helped himself to a brace with Serge Gnabry and Leon Goretzka scoring the other two goals. Dodi Lukebakio scored Dusseldorf’s consolation from the spot, a minute before the 90th minute mark. The three points see Bayern march onto 67 for the season, one ahead of Borussia Dortmund who scrapped to a 2-1 win over Mainz on Saturday, thanks to a Jadon Sancho double. Elsewhere, RB Leipzig moved closer to sealing third spot with a 2-0 victory over Wolfsburg on Saturday. A goal each from Kevin Kempl and Timo Werner was all that Leipzig required to march onto 58 points, six ahead of fourth placed Frankfurt who lost 3-1 at home to Augsburg the following day. In the battle for the other remaining places for Europe, Monchengladbach, Hoffenheim, Leverkusen and Bremen were all victorious in their respective fixtures. Gladbach defeated Hannover 1-0 away from home, Hoffenheim beat Hertha Berlin 2-0, Leverkusen were 1-0 winners at Stuttgart while Bremen overcame Freiburg 2-1.